I learnt this recipe from my mother-in-law. I am still learning from her whenever I visit India. I didn’t get much chance to cook with her as I moved abroad as soon as I got married, I make sure to learn new things & recipes from her even while chatting. Note: cut chicken into 1 inch cubes.Instead of veg-non masala you can add 1/2tsp chilly powder & 1tsp coriander powder. Note: you can use coconut instead of Desiccated coconut & Coconut Milk Powder. I like to use non-stick pan for dry items to avoid food sticking at the bottom. 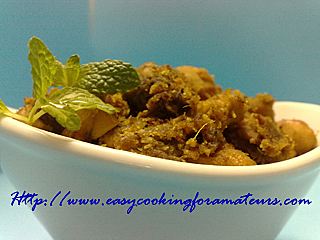 Dry grind the cinnamon, clove, cardamom, non-veg masala Powder, pepper & turmeric powder. Add coconut, coriander, mint, ginger, garlic, onion & grind to rough texture. Note: The mixture should be rough powder not fine powder. Add oil in a non-stick pan. Add onion & 1/2 tsp salt cook till onion turns light brown. Add 1tsp salt & 2tsp Non-veg masala powder stir & close the lid. Cook for 10 to 15min. Add grinded Mixture & stir. Cook till the raw smell goes. Close the lid & cook for 15min. Keep light stir in between. Note: Don’t stir too much this can cause chicken pieces to get mashed up. Cook till chicken gets coated, dries completely (water evaporates completely) & the colour turns light brown. Add coriander & switch off the stove. The green grinded mixture will turn to brow when completely cook & gives a good taste with concentrated flavor. Note: This item can be cooked in 2 ways dry & gravy. Those who like gravy don’t cook till it dries completely.